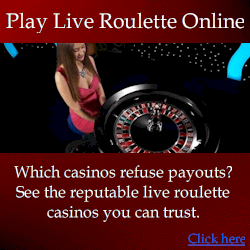 Generally as there are many legitimate legal methods to win at roulette, you don’t need to cheat. Sure a cheating roulette strategy can make things easier for you, but it should never be attempted unless the predictive methods are legal where you play. In just about every case, illegal cheating is when you actually affect the outcome of spins. Legal cheating is where you don’t actually affect the outcome of spins, but you use predictive devices. 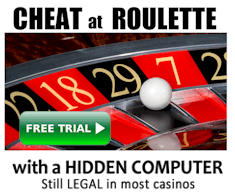 Millions can and indeed have been won at roulette with electronic cheating devices called roulette computers. Although they are a casino’s worst nightmare, they are in fact legal to apply in approximately half of casinos. This doesn’t mean they are welcome, so if you apply such technology and are caught, you’ll certainly be asked to leave. For those brave players who aren’t afraid to covertly apply such devices, this is without a doubt the easiest and most effective method of beating roulette. For a very thorough explanation about how roulette computers work, see how to make a roulette computer. The following methods are largely illegal and should not be used in the casino environment. This is simply tampering with the wheel. There are many ways it can be done. For example, on some wheels you can loosen the frets (pocket separators) on closed tables when no-one is looking. This will create a kind of wheel bias where the ball’s momentum will be absorbed more by the loose pocket, making the ball tend to come to rest in one section of the wheel more than any other. Generally though, wheel gaffing is done by crooked casino staff who want to make winning easy for their associates. If a casino employee has good access to a wheel, they may also slightly bend or warp the wheel rotor shaft. This causes the wheel to have a slightly uneven deceleration whereby the wheel’s deceleration rate is higher when the wheel rotor is at a particular orientation. If the wheel has a common drop point (if the wheel is tilted), this would mean particular numbers on the wheel rotor will be under the common ball drop point more frequently than others. This in turn would mean the ball would come to rest in a particular area of the wheel more than any other. With the seemingly unpredictable bounce of a roulette ball, it can often appear as though the ball has a magnet in it. Do casinos cheat and rig their wheels? Very, very rarely – it only ever occurs in locations where gambling is not a regulated industry, at unlicensed casinos where there is no gaming licence to lose, or in high stakes private games where one spin can earn or lose a casino millions. Of course even in countries where gambling is unregulated, such a form of cheating would likely be considered cheating, but that doesn’t mean it doesn’t occur. If you play at a licensed casino, and aren’t wagering million dollar spins, then you can be almost certain the wheel has not been rigged. Why? Because if the casino cheated, they’d be risking their entire gaming license and many years of revenue – not at all a financially viable risk especially when they naturally have the edge over the player. There was one particular incident where a ball with an internal magnet was used to cheat a casino. The players were able to direct the ball to areas where their bets were made. The scam was eventually discovered, and left the casinos perplexed as to how they had swapped the original ball with a magnetised ball. In such a case I believe it would be reasonable to assume crooked casino staff played a part in exchange for part of the winnings. In some casinos, leaning against the table or wheel can lower one half of the wheel, making the ball tend to fall at one point more than any other. This is what you would call a heavily tilted wheel. As you would already know approximately where the ball would fall from the ball track, it would then only be a matter of knowing the wheel orientation at the time the ball fell. This gives the player an advantage that’s large enough to overturn the casinos small edge. This kind of cheating method is very rare nowadays as modern casinos usually strictly prohibit leaning on or around the wheel, and usually wheels are protected by Perspex. Casinos staff who have easy access to wheels can spray or paint virtually invisible polymers or plastics on the pocket surfaces. This creates a deadening of the pocket surface so that when the ball hits it, the ball doesn’t bounce as much, and will therefore come to rest in one sector of the wheel more than the others. the actual material when applied must be invisible to the naked eye which is not at all impossible, especially on some wheel designs.